Previous entry: "Fight The Future: athenaverse vs. myspace"
Next entry: "Adele Bloch-Bauer Headed To Neue Galerie"
06/03/2006: "Friday Night At LACMA"
Last night I went to the LACMA (Los Angeles County Museum of Art). I heard that not only was it free after 5, but they have free jazz concerts on Fridays. The real reason I went however was to see the painting "Adele Bloch-Bauer I" by Gustav Klimt. I went on a date last month with a woman who mentioned the exhibit so I went to the LACMA website to see what the hubbub was about. I was immediately taken by the painting. I have never felt such a deep connection to a piece of art before. Although I put it as my desktop background at work after I read about it, and I knew about the free after 5 program, I procrastinated about going to LACMA for several weeks. Yesterday I decided that I wanted to go after work. When I finally saw the painting hanging in the gallery, it totally blew my mind. I spent 20 minutes looking at the painting from all angles. 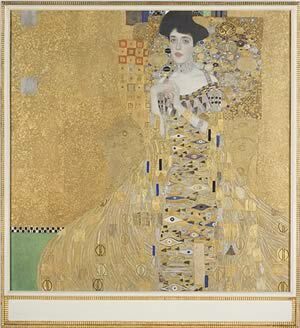 Although I "knew" that a photograph of a painting cannot compare to seeing the painting itself, I did not "know" until I stood there in front of this canvas as Klimt did 99 years ago and created this masterpiece. The colors, her expression, the different textures, it was all there. I finally felt for myself the powerful attraction that art has for people. It was so relaxing to empty my mind and contemplate this painting. Although I looked at the other Klimt paintings in the exhibit, I returned to this one several more times before I finally tore myself away from it so I could see the other paintings that I wanted to see ("Magdalene and the Smoking Flame," "St. Augustine," this amazing landscape by Hubert Robert). For the rest of the evening, I wandered around the museum finding wonder and beauty in everything. I ended up buying a print of the painting as I had planned to hang up in the living room and a Klimt art book, but I left LACMA with something even better. Beholding the painting inspired me and reawakened my thirst to make art again. In 99 years, I hope that something I create will do the same for another artist who has lost their way.